Alfie May scored four times - including a 29-minute hat trick - as Doncaster Rovers breezed past Chorley to set up an FA Cup second round trip to Charlton Athletic. May took his personal tally to eight goals in his last four starts, while Herbie Kane, Matty Blair and John Marquis also netted in a one-sided replay. Rovers narrowly avoided the banana skin just over a week ago when they twice had to come from behind at the National League North promotion chasers’ intimate Victory Park ground. But they made light work of the re-match and the obvious gulf in class was reflected in a scoreline which matched Rovers’ biggest ever cup win against Blyth Spartans in 1937. After a difficult few weeks the easy victory was a real confidence-booster ahead of this weekend’s derby clash at Barnsley. Rovers surged into a 5-0 half time lead and boss Grant McCann was afforded the luxury of resting James Coppinger and Ben Whiteman for the second period, while Tommy Rowe got another 45 minutes under his belt following his match-winning cameo against AFC Wimbledon. But not everything went to plan as Tom Anderson was sent off for two bookable offences and will now miss the trip to Oakwell. Chorley actually made a promising start but visiting goalkeeper Matt Urwin’s first touch was to pick the ball out of his net after May latched onto Kane’s ball over the top and was afforded the space to lash home right-footed off the inside of the post after seven minutes. Moments later the former non-league striker, in for the injured Mallik Wilks, diverted Blair’s cross just wide as Rovers continued to benefit from time and space in the final third. 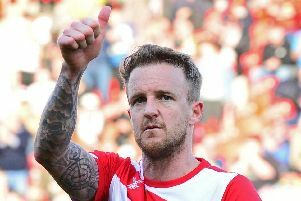 Coppinger was next to go close after Rovers carved Chorley open only to see his shot kept out by a combination of a defender and the post after rounding Urwin. Blair doubled Doncaster’s lead midway through the first period, nodding in from close range after Anderson headed Coppinger’s cross back across goal. Kane drilled one superbly into the bottom corner from 25 yards just before the half hour mark. Just two minutes later May got in behind again and struck a smart left-foot finish into the far corner. And he completed his first ever hat trick in full time football just six minutes later when he fired home from close range after Andy Butler’s header was parried by Urwin. The one-way traffic continued after the re-start, although Rovers’ intensity understandably dropped. With Ian Lawlor a spectator at the other end, Marquis was brought down in the box by the busy Irwin after 73 minutes only to see his penalty diverted wide by the Chorley goalkeeper. May added his fourth by lashing home Danny Andrew’s cross. And Marquis exquisitely curled home his first goal in six games before cupping his ears to the Rovers fans in celebration. ROVERS: Lawlor, Mason, T Anderson, Butler, Andrew, Whiteman Rowe 46), Blair, Kane (Crawford 70), Coppinger (Taylor 46), May, Marquis. Subs not used: Marosi, Blaney, Amos, Beestin. CHORLEY: Urwin, Anson, Teague, Leather (Jordan 64), Meppen-Walter, Blakeman, O’Keefe, Cottrell, Newby (Whitham 59), Almond, Wilson (Noble-Lazarus 71). Subs not used: Lussey, O’Brien, Lenehan, Eccles.